MEBO Research is most grateful to the hundreds of applicants who answered the pre-screening questions below in an effort to become participants in the uBiome funded MEBO Gut Microbiome Study, "Microbial Basis of Systemic Malodor and PATM Conditions (PATM)" registered with ClinicalTrials.gov. All 100 applicants from around the world have been selected and have received their kits for sample collection. 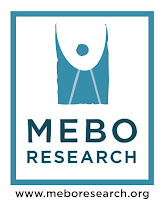 We are no longer recruiting participants for this study, though anyone interested in being considered for future research and/or testing participation opportunities with MEBO may send me a private email with the answers to the questions (click on icon below) to be placed in the MEBO Master Database. 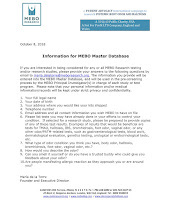 Answers to the questions may be sent to maria.delatorre@meboresearch.org . Much gratitude goes to all who applied to participate in any and all MEBO test and/or research program. Probably due to lack of research for other conditions. Without research, there is too much uncertainty about the outcome of any procedure or medication.